CES 2014 Highlights: Day 2 | What Hi-Fi? Samsung and LG provide some of the biggest talking points on the second day of CES 2014, with both firms unveiling 'world-firsts'! Samsung and LG have provided some of the biggest talking points from the second day of the International Consumer Electronics Show (CES) in Las Vegas, US after the two companies both unveiled 'world-firsts'! In the spectacular surroundings of the Bellagio hotel, Samsung got the ball rolling by revealing an 85in 'bendy' TV, with a small motor at the back of the screen pushing the edges out from flat to slightly curved. Samsung wouldn't confirm if the TV was destined for production, but we can expect the forthcoming UE9000 series of curved LED Ultra HD 4K screens - leading with the flagship 105in model (above) alongside 78in, 65in and 55in sets. 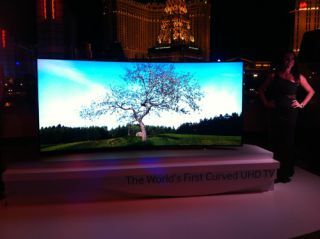 Meanwhile, LG has revealed a 77in flexible OLED TV that promises the "ultimate viewing experience". The angle of the curve on the TV can be altered by viewers by using the remote control to suit your own preferences. According to LG, its flexible OLED TV has undergone thousands of hours of testing to make sure it can go from flat to curved and back again without breaking under the strain, but there's currently no official confirmation of a retail release. A number of manufacturers revealed their line-up of TVs for 2014 on the second day of CES 2014, with Ultra HD 4K gaining momentum as LG, Panasonic, Sharp, Sony and Samsung (mentioned above) all releasing new models in the months ahead. LG has announced it will be launching 42 sets this year, with five models set to form part of its commitment to keeping plasma technology alive. There will be eight LED/LCD ranges with 25 TVs - at least half with LG's new webOS smart interface - and six ranges (12 sets) displaying 4K Ultra HD. The new webOS interface is aimed at making smart TV a simpler experience and has confirmed suggestions from last week’s leak that the design has been overhauled. This year will see a new 4K range and five new LED series from Panasonic, although the company's much-loved plasma screens were - as expected - nowhere to be seen. Panasonic has promised its new sets will deliver plasma-level picture quality using LED technology, and there has also been a redesign of the Life+ Screen platform. The new-look smart TV platform will feature on all 2014 smart TV ranges and will build on the personal customisation improvements that were rolled out during 2013. Sharp has said it will be releasing 14 new models across four ranges this year, with the Aquos range set to feature four new series of LED smart TVs of 60in and above. Among the new additions to Sharp's TV family will be the flagship Aquos 4K Ultra HD TVs (60in and 70in) and the Quattron+ range - available in 60in, 70in and 80in. The Quattron series will feature 60in and 70in sets and the entry level Aquos HD series will offer seven screen sizes starting at 32in and going up to 90in. There was no shortage of announcements from Sony during its CES 2014 press conference, with the company announcing a big push in Ultra HD 4K televisions. Three new ranges of 4K TV and seven new models in total will be released this year, with some, such as the 65in KD-65X9005, featuring a new "wedge" design. Meanwhile, Sony also revealed that it will be working with Netflix to bring Ultra HD 4K streaming into the home during the first half of the year. It is yet to be confirmed, however, when UK viewers will be able to take advantage of the partnership, if it will be exclusive to Sony, or if it will come at an extra cost. It's not every day that we see a new British hi-fi company appearing on the international scene, but this week at CES has seen Mitchell and Johnson make its US debut. The firm has unveiled a new range of components - including amplifiers, CD players, music streamers, tuners, digital-to-analogue converters, headphones and more! Although the products are currently built in the Far East, they are designed and tuned in the UK and the firm hopes to begin assembly of some models in the UK soon. British speaker company Damson is using CES for the international launch of its first wireless multiroom music system with the Jetstream 1 speakers. The speakers use the firm's Optimized Room Audio technology to allow the speaker to 'learn' the acoustic qualities of the room it's being used in and adjust itself accordingly. In addition, the speakers offer multi-one use, as eight of them can be synched together to operate in party mode with the same music playing in each room simultaneously. Like its arch-rival Samsung, LG is making a move into the market for wireless multiroom speakers with the release of two new models - the LG NP8740 and the NP8540. Both use the latest mesh network technology - including dual-band wi-fi support - and several speakers can be set up in different rooms to create a simple multiroom system. Panasonic is another company to enter the multiroom speaker system market at CES 2014, with the launch of the SC-ALL series using Qualcomm's AllPlay platform. New models include the SC-ALL8 and SC-ALL3 wireless speaker systems, together with the SH-ALL1C network audio connector to upgrade an existing speaker system. • Panasonic has also teamed up with Abbey Road Studios to create an eye-catching in-car audio concept using a 2014 Mini Cooper Clubman S.
The Abbey Road Studio Premium Demonstration Vehicle boasts 12 Panasonic in-car speakers and a 12-channel 580W amplifier, as well as two EMI TG12412 equalizers. Monster is one firm that always makes plenty of noise at CES and 2014 is no different, with 'Head Monster' Noel Lee revealing tie-ins with Adidas, the UFC and more! There was also news of a new range of headphones - including the DNA Pro Wireless over-ear headphones with wireless aptX Bluetooth and active noise-cancellation. "Buttonless touch-sensing control" also features as part of the new headphones, which are expected to be available from Q2 2014 with a price tag of $450. One company that is certainly keeping itself busy at CES 2014 is Panasonic, which is unveiling two new pairs of headphones alongside its other products in Las Vegas. The RP-HC800 noise-cancelling headphones feature 40 hours of playback from one AAA battery, while the RP-BTD10 wireless Bluetooth headphones offer NFC pairing. There may have been notable TV announcements on day two of CES 2014, but LG, Panasonic and Sony all also confirmed details of new soundbars and soundbases. LG has showcased two new soundbars: the LG NB3740A and NB5540 (above), with the latter offering Bluetooth, a hi-fi DAC and a Class D amp. The firm also revealed a new entry-level SoundPlate for TVs up to 55in and a 'step-up' model, the LAB540W - including a built-in 3D Blu-ray player and smart TV functionality. The Panasonic soundbar range has been refreshed for 2014, with three new models announced - the SC-HTB880 (above), SC-HTB580 and SC-HTB8. All three models are super slim and wall mountable, with the flagship SC-HTB880 set to offer 4K passthrough technology, a wireless subwoofer and NFC connectivity. With soundbars and soundbases both proving popular, Sony has options in each camp - including the HT-XT1 Speaker Base, which is due April 2014 at a price of £299. Meanwhile, the HT-CT770 soundbar (above, £450, due May 2014) sports an intriguing angled design and features a 330W power output and hi-def audio decoding. Panasonic and Sony also introduced CES delegates to their new Blu-ray players for 2014, with the BDP-S6200 from the latter due out in February 2014 at a cost of £200. Meanwhile, Panasonic has three new players: the BDT360 3D Blu-ray player with 4K upscaling, and the DMP-BD91 and DMP-BD81 regular players with built-in wi-fi. Astell & Kern has launched its new AK240 high-resolution portable audio player, which builds on the success of the AK100 and AK120 - introduced to the UK late last year. In addition to a brand-new look, the AK240 incorporates a series of new features not currently offered by any other high-res portable players on the market. • Remember, you can follow all the latest from CES 2014 press conferences, product launches and keynote speeches with live updates from the whathifi.com team. Follow us on Twitter and Facebook to track events as they happen!